A middle school teacher shares her experience successfully merging two seemingly different challenges: flipping her classroom and integrating NGSS storylines. A few years ago, I found myself searching for a way to help make content more meaningful and available to my students. I eventually decided to flip my eighth-grade science classroom. I spent a summer researching different methods and ideas for implementing flipped classrooms. As I researched, I found that each flipped classroom was a little bit different, as teachers took the idea and made it their own. In general, the idea of a flipped classroom is to have students view videos of lectures as homework outside the classroom, so that class time can be utilized performing hands-on activities. What are the two types of mixtures discussed on the notes? What does it mean to dilute something? Figure 1. Five essential questions for students to answer after watching a video about mixtures. I tested a variety of online platforms and programs for creating videos and presentations. I carefully reviewed my curriculum and created a structure that I thought would work for what I needed to accomplish. I already had presentation slides for most of the content in my course, so I made a few modifications to the PowerPoints and then used screencasting software (Screencast-O-matic) to record the flipped videos. Because I teach at the middle school level, I decided to create videos that were very concise: not much longer than five minutes. I also developed flipped notes reviews, each of which included five essential questions (see Figure 1) that the students should be able to answer if they took adequate notes during a video. During my first year of flipping my classroom, I spent the first few class periods teaching the students how to write notes using the Cornell format and I walked them through the process of taking notes from a video. At first the students grumbled and were rather unimpressed. Their biggest complaint was that they had to watch part of the video, pause it to write their notes, and then resume the video. I stuck with it though, and the grumbling stopped fairly quickly after we had established a classroom routine. I asked the students for feedback regarding what they did not like about the system and I worked to incorporate their ideas into my carefully researched structure. At one point, I had students take regular notes in class, and was shocked to hear them say that they wanted to go back to using the flipped notes instead. The first year that I flipped my classroom, I observed that there were several important benefits. For example, I finished with the content two weeks early, so I was able to include an additional unit of study for my students, and also complete additional hands-on activities and experiments. The structure of the flipped notes was also beneficial for my auditory and visual learners. Last but not least, students who lost their notes could still access the information online, and parents could listen to the notes as well. After the first year of implementation, I provided students with access to an entire unit of flipped notes at one time (usually five separate videos) so they could work ahead. The students receive a unit information sheet that explains the title of each set of notes, the length of the video, and the date the video is due. I have spent the past couple of years fine-tuning the flipped note system that I use, changing it a little each year to better match the needs of my students. After the first year of flipping, I rerecorded the first few sets of videos to provide the students with more structure and guidance in taking their notes. For instance, within the video I ask the students to write the name of the unit at the top of the page and record various pieces of information on the left and right sides of their page. The students are then expected to complete their notes outside of class. Most of my students have access to technology outside of school, but students are also able to come into the classroom to borrow a Chromebook before school, during study hall, or for an hour after school each day. Since the initial implementation, I have also begun using the program EDPuzzle, which allows me to embed questions into my videos and also to monitor how many times each student has viewed a video. Another key element that I learned to incorporate into my flipped classroom is to host a parent technology meeting. At the beginning of the school year, I invite parents to a workshop during which I explain the procedures and processes involved in our flipped classroom and how students can use the technology tools to complete their notes. This has been a great way to meet parents and help them feel more comfortable with the flipped classroom model. Figure 2. 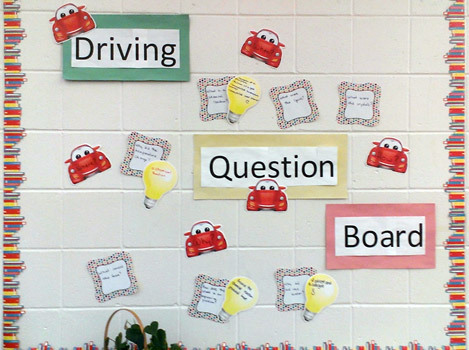 A driving question board is displayed in the classroom. Questions are written on the squares, answers are recorded on lightbulbs as they are determined by the class. After the first year of utilizing a flipped classroom, I attended a workshop about how to use a storyline to address the three strands of NGSS. I liked the idea of using a storyline to help create a more coherent learning experience for students, because each lesson of a storyline connected to the previous lesson. I decided to spend more time learning about storylining in search of a way to effectively implement both techniques simultaneously. With that aim, I have spent a tremendous amount of time in workshops learning about the storylining method of science instruction. In general, when using a storyline, students are introduced to an anchoring phenomenon or event designed to catch their attention, such as a video of a lightning bug or refraction. The phenomenon may be out of the ordinary or a common occurrence, but it should be something driven by a scientific principle that students cannot easily explain. To make sense of the event, the students ask questions about the phenomenon. Next, they categorize and prioritize these questions, and place them on a driving question board (see Figure 2). Later, students investigate the questions through a series of experiments and explorations to help them explain the anchoring phenomenon. Once the class selects a question to answer, the students determine the best way to answer it. They may answer a question by performing their own research, doing online research, or seeking out related examples in their everyday lives. After they answer one question, they move on to the next. Sometimes students’ investigations lead them to ask and answer new questions. Throughout the unit, the teacher is responsible for guiding the students and ensuring that the manner in which they explore and answer the questions is tied to NGSS. Further information about storylines can be found at Next Generation Science Storylines. At first, I was hesitant to believe that an anchoring phenomenon and the creation of a driving question board would garner much interest from my students, let alone guide our work through an entire unit. I contemplated how I could incorporate storylining into my flipped classroom, especially since the idea of storylining lends itself to student-driven discovery, rather than frontloading with vocabulary and concepts. However, the more storylining professional development I participated in, the more willing I became to give it a try in my classroom. I worked with science teachers from other schools in the area to create a chemistry storyline using the elephant toothpaste demonstration as an anchoring phenomenon. After the students observed an elephant toothpaste demonstration, they came up with a variety of questions about it. Their questions included, Why did it change color? Why did it get hot? and, What was mixed together? After the students had developed their questions, I examined the flipped notes to be used during the unit. I scheduled the unit so that the notes for each topic would be due after the students had conducted related experiments in class. For instance, the students would complete an in-class experiment dealing with solutions and suspensions prior to completing the flipped notes over mixtures. In reality, some students finished their notes early, so they already had access to some of the terms that we were exploring during the unit. This did not negatively impact the lessons, and in some cases it actually helped — because some of the students were able to help their classmates better understand the concepts they were investigating. While my implementation of blending storylines with flipped notes is still in its early phase, I am pleased with its impact on my classroom so far. The storylining process has helped make my curriculum more cohesive by providing students with more authentic chemistry explorations. Maintaining my flipped classroom has continued to provide my students with online access to their notes and has streamlined and differentiated the note-taking process in my classroom. To be certain, both storylining and flipped classrooms require thoughtful planning and preparation to ensure successful implementation. As with many aspects of curriculum development, they also require instructor flexibility, as the instructor should continually evaluate and modify their implementation to best meet the needs of their students. I will continue to find ways to improve my own incorporation of storylines and flipped notes into my classroom for the benefit of all of my students. Jennifer Smith is a National Board Certified Teacher who is in her 14th year of teaching. She currently teaches 8th grade science at Monticello Middle School in Monticello, Illinois, where she is also the science club sponsor and makerspace coordinator.